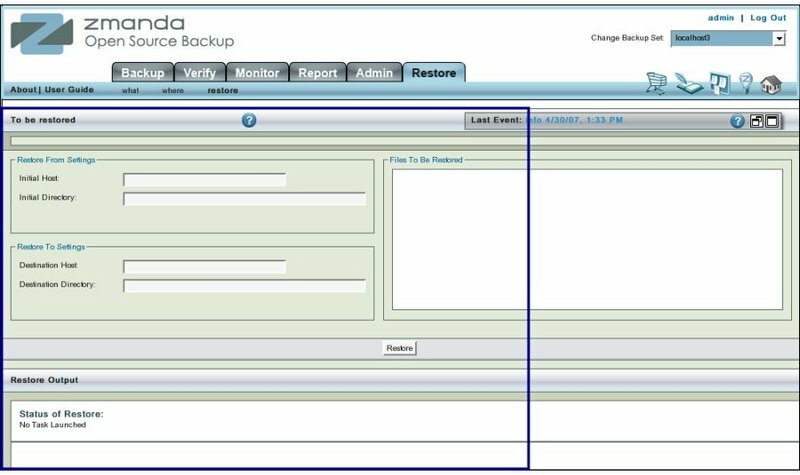 The Run Restore is the third and last step in the recovery/restore process in Zmanda Management Console. The main functionality of the Run Restore page is to allow users to actually restore the data to the directory they have chosen . The data will be restored as per the conflict resolution options that they have specified. Like all other functional pages of ZMC, the Run Restore page has its main functionality in the center, while other common-to-most-pages functionalities are grouped at the top of the page. The left panel (No 1 above) displays the Restore From and Restore To settings that have been set earlier in Restore Where pages. These are not editable here. If any editing has to be done to the data displayed, it has to be done on Restore What and Restore Where pages. The left panel (No 2 above) also displays the Directories /Files to be restored that have been selected earlier in Restore What pages. If any editing has to be done to the data displayed, it has to be done on Restore Where pages. To cater to long lists of items that may be needed to be restored,the list at the bottom has a page turner control. The right hand panel, Output panel, (No 3 above), is initially blank showing a message that "No Task Launched". If there had been an earlier restore operation,it will show that output. 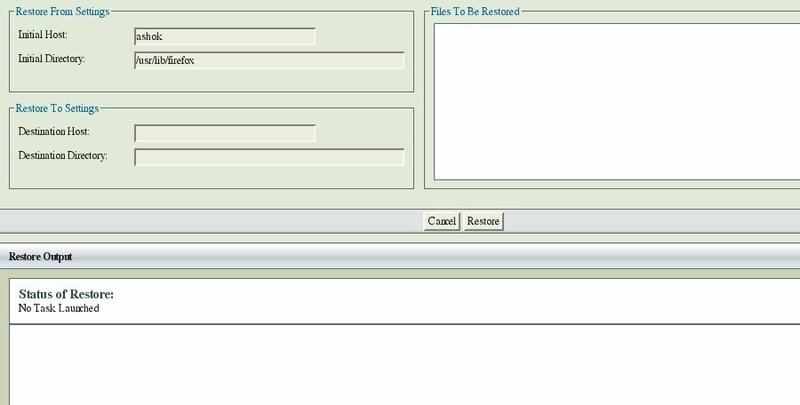 Clicking Clear output hyper link will clear the panel. When Restore Button is clicked, it changes its message and asks for the password to the Destination Host (if ssh key exchange has not been setup). If ssh key exchange is setup it will tell users which tapes will be required for this restore operation. Supply the password and click the Submit button. Restore task will start on clicking the Submit Button. It will ask users to supply the appropriate tapes in the appropriate slots. If an archive spans more than one tape, ZMC will prompt for additional tapes as required. Once all tapes have been supplied, the Directories/Files will be restored in the Destination Directory. Necessary changes will be made to the Existing files as per the chosen option(s). The page has no dependencies. Users are free to go to any other page or quit the application. Most users will want to open the files restored to check that they contain the proper data.